The emergence of routes from place to place is a complicated process. Sometimes they follow the direction of a previous Roman Road passing through the countryside. There are rumours of a lost Roman road west of Easingwold. Roads need to have usable surfaces. The turnpike roads were set up as a result of various Acts of Parliament. The wearing surface needed to be good for use by carriages and those on horseback and on foot. Trusts were responsible for these roads, and to pay for the upkeep, those who used the route were charged by the mile depending upon what the vehicle was and how much produce was being carried. There are old records of the charges incurred by this traffic which are fascinating. It was much easier to keep a tally book with written entries and then matters could be settled up periodically. The outward sign of turnpike roads these days, where the ravages of damage, destruction or loss have not affected them, is the mileposts which, as their name implies, are – or were – every mile along the road. The mileposts hereabouts in the Vale of York are cast iron, prism shape with hollow back, and with mileage to London on the top face, or NRYCC. 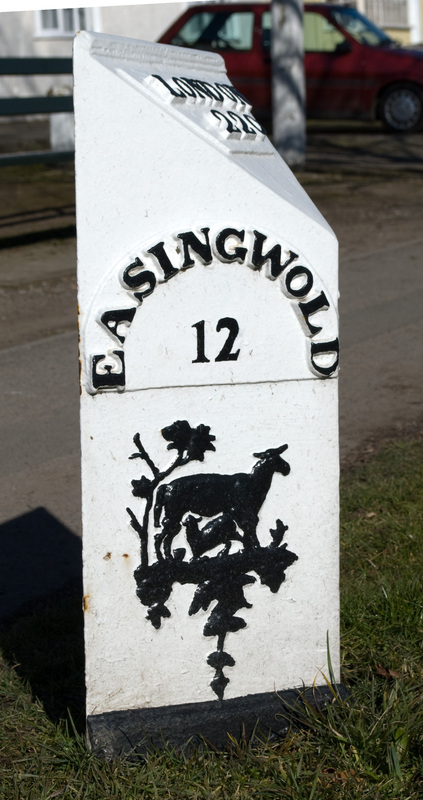 The mileage to York or Thirsk or Stillington or Easingwold, and the destination, is on the appropriate vertical face of the milepost. We have photographed nearly all of them and these images are in the Gallery. It is a real concern how neglected many of these mileposts are. Many lack any vestige of paint or stand drunkenly. They are all Grade II listed structures, and as such, are the responsibility of the owner ie North Yorkshire County Highways Department. We can report that one milepost, dislodged by a vehicle in 2009, and left upended in a dry ditch, is now repainted and standing safely upright once more. That is good news. This particular milepost illustrated within this text is clearly well cared-for and its particular significance for Easingwold is self-evident. It is a standard of care which all mileposts and listed historic structures should enjoy. We have looked at the question of repainting mileposts as a Society project, but the speed and density of traffic on the A19 and the road’s close physical proximity to the position of many mileposts makes this something which we cannot undertake. Proper and safe screening for personnel, and traffic management, would be essential.